Open DVD ripper is powerful DVD ripping and converting software. It can rip/convert DVD movies to popular audio and video formats. The most powerful DVD ripper and converter. Open DVD ripper V3.80 is officially released. Fixed the problem that all texts cannot be displayed where there are excessive characters in the "Customized subtitles" window. Added the yellow-dot prompt for the new profiles. Open DVD ripper V3.70 is officially released. Supports all latest DVD movies released before September 2014. Open DVD ripper V3.60 is officially released. Open DVD Ripper for Mac V1.50 is officially released. Supports the latest version of Mac OS. Open DVD ripper V3.50 is officially released. Optimized to support latest DVD movies. Upgraded the transcoding module, and improved the ripping speed. Open DVD Ripper for Mac V1.40 is officially released. Optimized the format conversion speed for Mac OS. Open DVD ripper V3.40 is officially released. Rips more up-to-date DVD movies. Preview the source DVD movies more accurately. Open DVD Ripper for Mac V1.30 is officially released. Added support for latest video/audio formats. Open DVD ripper V3.30 is officially released. Enhanced the function of the Expert interface. Optimized the image quality of DVD transcoding. Open DVD ripper V3.20 is officially released. Enhanced the running stability of the program. Open DVD Ripper 3 Lite is officially released. With only $14.99, the registered users of Open DVD Ripper 3 Lite (or DVD-Cloner) can click HERE to get Open DVD ripper 3 to rip DVD movies to more video and audio formats and convert 2D movies to 3D format! The wizard interfaces make the converting process easy and fun. Select to enable or disable the GPU acceleration function which makes the DVD conversion much faster. Converts the DVD folder or ISO file from the hard disk to a target file. Locates the target path and plays back the converted movie with shortcut icons after the conversion. Select multiple chapters, audio track and subtitle to rip. Shows users the time needed to convert a DVD movie. Select to enable or disable Smart Analyser before reading the disc. Select to enable or disable subtitle when ripping DVD. Open DVD Ripper for Mac V1.20 is officially released. Enhanced the function of reading ISO files. Updated the contents of the profile menu. Open DVD ripper V3.10 is officially released. Added the function of detecting the free hard disk space before the conversion. Optimized the selection function of the "Profile" menu. Open DVD ripper 3 is officially released. Added the Express and Expert interfaces which enable both beginners and advanced users to operate Open DVD ripper 3 more conveniently. Optimized the HST™ encoding speed which brings higher conversion speed. Optimized the encoding speed of H.264. Added the function of converting 2D to 3D movies with perfect quality. Added the function of GPU decoding. Converts multiple chapters simultaneously, saving more time for users. Supports to set the starting and ending chapters for conversion. Converts the ISO files into many video and audio formats. Open DVD Ripper for Mac V1.10 is officially released. Supports most of the newly released DVD movies. Rips DVD to many popular video and audio formats on Mac OS. Converts ISO files to many multimedia formats with high quality. Rips the whole movie or the main movie. Previews the movie clips you want to rip. Open DVD ripper V2.50 is officially released. Open DVD ripper V2.40 is officially released. Enhanced the function of the audio track and subtitle. Adjusted the reading mode for I/O, and makes the DVD reading smoother under the Windows XP/7 operating systems. Open DVD ripper V2.30 is officially released. Added the function of Smart Analyser. Enhanced the subtitle backup function. Improved the speed of creating AVI files. Added the function of selecting several chapters at one time. Added the function of GPU acceleration decode for NVIDIA and ATI video cards. Open DVD ripper V2.20 is officially released. Added the support for subtitles. Added the support for 6 audio tracks. Updated the reading function for DVD, and supports for more latest DVD movies. Open DVD ripper V2.10 is officially released. Enhanced the DVD scanning function. Perfectly reads latest DVD movies. Open DVD ripper V2.01 is officially released. Enhanced the function of format conversion from the DVD directory on hard disk. Fixed the problem of damaged images. 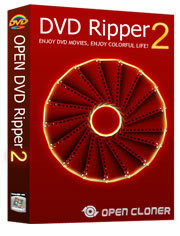 Open DVD ripper 2 is officially released. Rips DVD to more video and audio formats. Super high speed and perfect overall conversion quality. Supports more new media devices. Adds the image or text watermarks from hard drive into the video file. Selects the audio track for your video file. Sets the background of the video file as gray, aged film, etc. 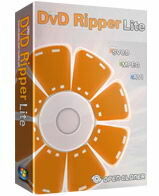 Open DVD ripper Lite V1.71 is officially released. Converts the source DVD movie to AVI, MPEG or SVCD format. Converts DVD movies to hard disk. Open DVD ripper V1.70 is officially released. Enhanced the function to analyze movies, and supports more latest movies. Open DVD ripper V1.60 is officially released. Enhanced the compatibility with fixed Bitrate in audio. Improved the analyzing process of the analysis window. Optimized the iPad video formats. Open DVD ripper V1.50 is officially released.